A thrilling, funny and fast-paced adventure series, Sherlock was co-created by Steven Moffat (Doctor Who, Coupling) and Mark Gatiss. A contemporary twist on the Arthur Conan Doyle classic stories, Sherlock Holmes (Benedict Cumberbatch), Dr. John Watson (Martin Freeman), and Inspector Lestrade (Rupert Graves) navigate a maze of cryptic clues and lethal killers to uncover the truth. The address is the same, the players are the same, and Moriarty is still out there waiting for them! 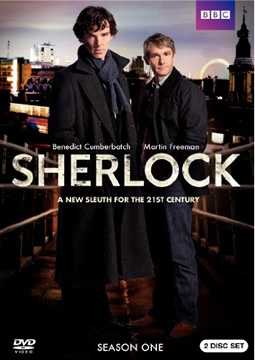 This two-disc set includes special features like commentary on episode one featuring Mark Gatiss, Steven Moffat, and Sue Vertue; commentary on episode three featuring Benedict Cumberbatch, Martin Freeman, and Mark Gatiss; exclusive pilot episode: Sherlock – A Study In Pink; and the Unlocking Sherlock “making of” featurette. You can purchase the DVD set for $23.99 or you can also try to win a copy here. To enter, you need to merely post a comment below.You can enter once per day. Guidelines: This giveaway is open to participants with a United States mailing address only. (International readers can enter if they have a friend in the States who can accept their prizes by mail.) Many may enter but one person will win. You must be 18 and older to enter and no purchase is necessary. Contest ends December 6, 2010. UPDATE: Congratulations to “Chris” who won this DVD set in our contest. Thanks to everyone who played and we’ve got more contests coming! My last entry. Good luck everyone! Only entry……….must be the winner. Entering again because this show rocks! And one more time… “Sherlock” is a great series– I highly recommend it. ooo last day! good luck to everyone! Love the new show! Quick pace, witty and charming characters. I also appreciate that it’s on our public television station. I can dvr and watch when I have time. It also helps that Sherlock and Watson are too cute.